If you’ve read my blog about having a Scope of Work, you know how strongly feel about having good project documents in place to ensure the success of your remodeling project. Well, another document that is just as important as the Scope of Work is your Construction Schedule. Where the Scope of Work defines all of the work that is included in your project, the Construction Schedule spells out how and when of all of the activities of your remodeling project will take place. Think of your it like an orchestral score. All of the construction team and your selections are the members of the orchestra just waiting for their time to shine while the conductor is your project manager directing the orchestra based on the score. A well-orchestrated Construction Schedule can be quite melodious when managed properly. 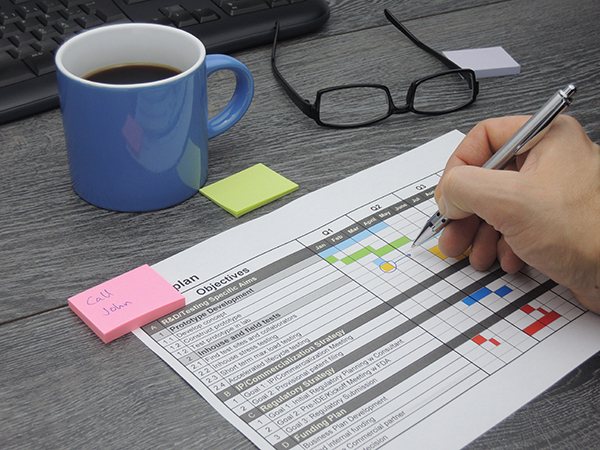 What does a well-managed construction schedule look like? First, your Construction Schedule should actually be a physical document that you can review and that is shared with the various trades working on your project. It should not just be in your project manager’s head. I wish I could say that once a construction schedule is created and documented that it will never change, but that is just not so. Which brings me to my second point. Your Construction Schedule will change. Each day and each trade has an effect on the construction schedule. One trade or vendor may take less time to do their task or they may run into unforeseen conditions and take a day or two longer. This is where your project manager, like a conductor, can make music of the schedule or just let it run amuck. The schedule, at a minimum, needs to be reviewed daily and adjusted for any changes that might have occurred. Finally, your Construction Schedule should contain enough detail so that you can easily see when the various trades will be working on your project and when the products you selected will be ordered. Our project managers live and die by their Construction Schedules because they tell us what has happened, what is happening now and what will be happening. This level of visibility gives us time to adjust the plan and schedule accordingly if we see anything not working as planned. As you can see, a well-managed Construction Schedule is critical to the success of any remodeling project. Before selecting a design-build partner for your remodeling project, make sure you ask for a sample Construction Schedule and talk to your contractor about how they use that schedule during a project. Having this document in place will keep everyone on the same page during the construction phase of your project.